Death is the greatest mystery of life. Its inevitability has been a source of wonder, fear, hopefulness, and puzzlement throughout history. Humans, being the only species consciously aware of the inescapability of death, have sought from time immemorial to cope with this unique insight. In Western society the traditional patterns of death were shaped by an ancient attitude informed by simplicity, meaningful ceremony, and acceptance. The experience was public; that is to say, a caring community of family and neighbors ministered to the dying person. In the traditional context, death was conspicuously visible throughout society and people went to great lengths to remind themselves of how fragile life is. Reminders of mortality were everywhere, whether they be in literature, paintings, oral traditions, or the cemeteries and churches where the physical remains of death intersected with the daily activities of the community. In this convergence, death held sway over the imagination of individuals, and was a source of elaborate ritual known as the ars moriendi. In these ceremonies that characterized the traditional patterns of death, acceptance and openness were the most important qualities. Throughout the ages particular rituals, along with their participants and meanings, may have varied. Nonetheless, death, dying, and grieving in the traditional model were an important part of everyday cultural practices. And the rituals they spawned connected dying and grieving persons to a broader community and set of meanings. In this way, the ordeal of dying was never just personal, it was communal. These great ceremonies, along with their deep religious and social meanings, accompanied dying persons into their deaths. They provided a sense of strength for the broader community that was being threatened by the loss of one of its members. Additionally, these traditional rituals were a healing balm to dying persons and their intimates, offering strength and comfort to both. In the twentieth century, the social and psychological landscape was transformed, redefining American cultural, social, and personal experiences of death. The result of this transformation is that dying, once an integral and meaningful part of social life, has become a source of terror and thus largely vanquished from public visibility. Herman Feifel has argued that this change has produced the American "taboo on death." Four major social trends are responsible: (1) the abdication of community to a pervasive sense of individualism; (2) the replacement of a predominantly religious worldview with one that is secular; (3) the sweeping power that materialism holds on the values, interests, and behaviors in modern society; and (4) the influential place of science and technology in daily life. As individualism, secularism, materialism, and technicism have become driving forces in modern American culture, the experience of dying and its meanings have been dramatically recast. Specifically, as individualism replaces community in daily life, community presence and support is withdrawn from the dying and grieving processes. Secularism as a way of life offers many opportunities and great pleasures, but is ultimately unable to offer meaning and comfort at the end of life. Like secularism, materialism poorly equips individuals and societies to grapple with the mystery of death. In addition, technological achievement and dependence have enabled humanity to actively fight against dying, thus forestalling death for countless numbers of individuals. In this technological framework, dying is no longer a natural, necessary, and important part of life. Rather, it is as if it has become an enemy. Success lies in its control and defeat; failure becomes defined as the inability to turn it away. These social changes have given rise to a new model of death, wherein dying and grieving are atomized and disconnected from everyday pathways of life, leading to their social isolation. As the historian Philippe Ariès astutely observes, in this context, dying has become deeply feared and a new image has replaced the traditional patterns of acceptance: the ugly and hidden death, hidden because it is ugly and dirty. As death has become frightening and meaningless, a culture of avoidance and denial has correspondingly emerged. Specifically, it has led to widespread pretense that suffering, dying, death, and grief do not exist. When individuals are forced to confront these inevitable experiences in their personal lives, they typically do so without social support and the comfort of participatory rituals or shared meanings. A pattern of death entirely unfamiliar in the traditional era has hence emerged. It is rooted in a sense of separation from the dominant culture and profound feelings of shame, both of which exacerbate the suffering inherent in the experience of dying and grieving. Female children were once considered a social stigma in China where "one-child" policies existed, and infanticide was common if a woman gave birth to a baby girl. 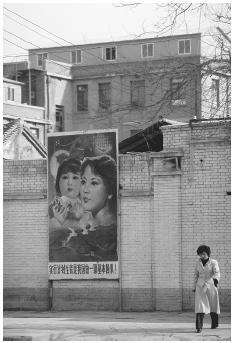 With the hopes of curtailing infanticide rates, billboard posters in the community still encouraged "one-child" policies, but said that it was acceptable to have daughters. a giant bandage. Why can't I just die? anything other than a cancer patient. feel so ugly, and it's just so depressing. I'm not myself anymore. Oh, the way I used to be. (tears begin to stream from her eyes). I'm a burden to everyone. This is no way to live. The pain, oh why? I'm just no good. Everything seems to lead me back to my cancer. Cancer, cancer, that's it! That's all there is. The portrait that surfaces from these voices is one of agony and regret. It reflects an isolation and terror that was unheard of during the eras of traditional death. Also emerging is a silhouette of evil, whereby the body is being decimated by disease and the very foundation of cultural and social life is being attacked. The result is that dying people and their loved ones often live in a state of social exile, enduring their suffering in isolation. Simply, these people suffer deeply and unnecessarily, and they do so in a societal context where the very idea of death has become inconceivable and unbearable. Ariès, Philippe. The Hour of Our Death. New York: Alfred Knopf, 1981. Elias, Norman. The Loneliness of the Dying. New York: Basil Blackwell, 1985. Feifel, Herman. The Meaning of Death. New York: McGraw Hill, 1959. Moller, David. Life's End: Technocratic Dying in an Age of Spiritual Yearning. New York: Bayword, 2000. Moller, David. Confronting Death: Values, Institutions, and Human Mortality. New York: Oxford University Press, 1996. Quill, Timothy. Death and Dignity. New York: Norton, 1993. I agree with the above though feel that the need to be accepted by a particular social group (gain social acceptance), has become the main social drive force in most communities and as status and money have become the end goals of most social groups, then the individual has no ability to sit out side the social group and validate their self worth (according to internal perceptions, hypotheses which may differ from the social group ). Social isolation has become synonymous with the concept of death. There is no objective forum for an individual to see their views out side then selves and/ or get feed back on weather their fears are justified or agree with other peoples perceptions of fear and or death. My own social interactions have shown me that the general population in Australia (generalization), is like a person with out a self focus or direction, I often wear taboo clothes like a female dress and or costume, though otherwise carry out what most people would perceive as an acceptable code of conduct ie I go shopping , have a cafe stop with friends , go to social functions etc and am a man at all times, only my appearance may differ from other men in clothing , sometimes it may be pajamas, or may be colorfull mens clothes, which make me stand out in a crowd. though as I do not mind what other people think or say about me , there appears to be no problem with the viewing audience (public). Yet, to ask some of my friends to do the same, is like saying putting a gun at their heads? it evokes great fear and hence they justify their fear as a socially acceptable function rather than admit that they are victims of conditioning. Personally I get no sexual or ego gratification by wearing womens clothing or other costumes though find it interesting that so many people are so easily controlled by these concepts???? To me standing in a crowd of many people while dressed as a man in a giant babies nappy (costume only) with the associated icons of a oral dummy, obligatory teddy bear, and babies hat, is the same as me wearing, mens pants and shirt except occasionally I find people looking at me , who once realizing I am aware of them try to cover up their gaze by hiding their face or eyes, as I am not under threat from their gaze.